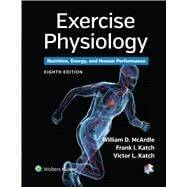 by McArdle, William D.; Katch, Frank I.; Katch, Victor L.
Setting the standard for more than 30 years, Exercise Physiology has helped more than 350,000 students build a solid foundation in the scientific principles underlying modern exercise physiology. This Eighth Edition is updated with the latest research in the field to give you easy-to-understand, up-to-date coverage of how nutrition, energy transfer, and exercise training affect human performance. Maximize your study time with the book’s vibrant, “magazine style” design that makes the content more engaging and accessible and key information easier to find. Reinforce your understanding with Chapter Objectives, Integrative Questions that pose open-ended questions for reflection on complex concepts, and FYI sections that offer “good to know” information. Gain an understanding of how researchers contribute to our knowledge of exercise physiology through engaging section-opening interviews with key figures in the field. Learn how theoretical concepts relate to practical skills through “In a Practical Sense” features. Access the most relevant current information in the field through figures and tables that clarify important concepts and information. Gain an understanding of the past, present, and future of the profession through coverage of important milestones and future directions in the field. Visit the free companion website for anywhere, anytime access to over 30 animations of key exercise physiology concepts, the book’s complete list of references, and more.